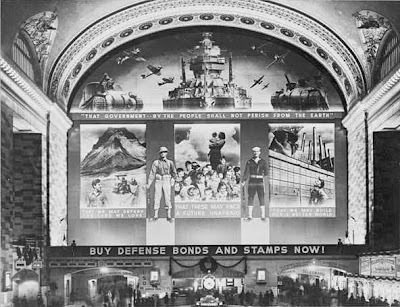 This gigantic mural display -- at the time, some said, the 'world's greatest photo mural' and I have little reason to doubt -- hung over the heads of commuters in the main hall at Grand Central, debuting with great fanfare (and a special radio broadcast) in December 1941. 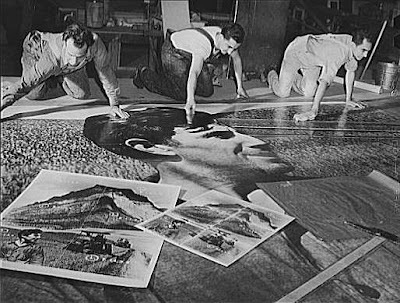 The 85-foot tall mural, featuring photographers employed by the Farm Security Administration, celebrates the most valuable traits of the United States: "the fertile U.S. land, the productiveness of U.S. industry, the future welfare of U.S. children." Ostensibly a device to sell war bonds, the mural was keenly placed considering that thousands of servicemen and women departed from Grand Central. In fact, a couple years later, Grand Central hosted a lounge specially catered to uniformed men. Below: workers scramble to install the massive display before rush hour.